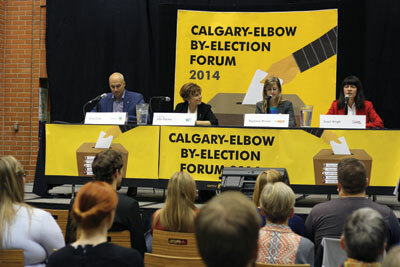 The Calgary-Elbow byelection forum took place Oct. 21 at MRU. PC candidate Gordon Dirks was a no-show and Wildrose candidate John Fletcher had a stand-in. The forum was open to the public, and featured questions about post-secondary funding and environmental issues. Calgary-Elbow candidates Greg Clark, Alberta Party, Stephanie McLean, New Democratic Party (NDP), and Susan Wright, Liberal Party, sat on stage at Mount Royal University in a forum for the upcoming by-elections on Tuesday evening. In proxy for John Fletcher, Wildrose candidate, Kerry Towle, the incumbent MLA for Innisfail-Sylvan Lake, took his place. Gordon Dirks, candidate for the Progressive Conservative party, was not present nor did he use a proxy. Towle says that while Fletcher was pulled away for a previous engagement scheduled three weeks ago, he still wanted to hear the student’s opinions. Towle said it was unfortunate Dirks decided to skip the forum all together. Dirks absence gave opportunity for the other candidates to slam the PC party on their lack of presence and funding issues. Applause and cheering could be heard after each jeering shot was fired toward the PC Party. Everyone was welcome to write down a question for the candidates. Although several questions were submitted, few were answered during the forum. Candidates debated through two rounds of questioning, with the first round being presented by the Students’ Association of Mount Royal University. Candidates were asked three questions on education, three on environmental issues and after a short 10 minute break, finished with a ‘speed question’ round where they only had one minute to answer questions presented by students. When asked how the candidates felt about the market modifier proposals that were put forth, Clark says Mount Royal has been put in a ‘difficult place’. According to Wright, before we can start looking at how to fix funding we must first, “dig ourselves out of the hole we’re in.” She says we have to put in $160 million dollars, if not more, just to hit baseline. In a question presented by SAMRU, it was stated that this lack of funding is resulting in three distinguishable setbacks: ask students for more tuition, reduce amount of seats available in programs or reduce the quality of education. Candidates were asked on how they plan on communicating with the government the importance of funding Mount Royal properly as a university. Due to lack of funding, says McLean, students applying straight out of high school are being rejected. Students are being forced to look into other post-secondary locations due to not being accepted into Mount Royal. Also talked about education against sexual assault that’s going rampant on campuses. Sexual education needs to be put on the forefront, according to candidates. This education includes what consent is, stigma against thinking it only happens to women and sexual education issues within the LGBTQ + community. Polls for the byelection will be open on Oct. 27. Go online to electionsalberta.ca to find a voting poll near you.